Our clients tell us our customer service that always exceeds their expectations, and they love being able to buy affordable kitchen cabinets. 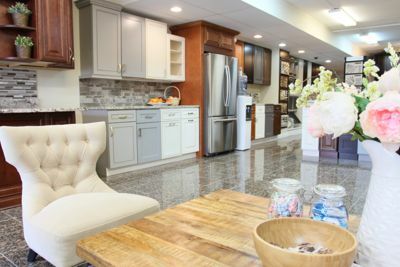 Whether you’re planning a kitchen re-modeling or you’re starting from scratch, the expert staff in our showroom can help make your next dream become a reality. We offer a fabulous selection of all-wood kitchen cabinets. Select the look that fulfills your dream kitchen, with wood options like maple or birch and a full palette of colors like cream, off-white, cherry, dark espresso, or cinnamon, and more. Count on us to give full attention to the details, like dove-tail drawer construction, adjustable hinges, and soft-close drawer glide systems. 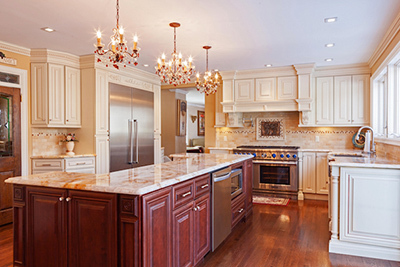 The Wood Cabinet Factory offers a wide selection of custom countertops for kitchens of all types and dimensions. Our beautiful granite, marble and quartz countertops come in a variety of stunning colors and intricate details. 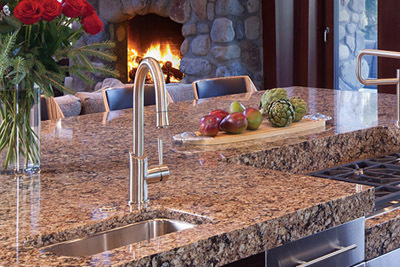 From exquisite Emerald Pearl to the understated Vyara Gold, you’ll find a kitchen countertop that fits perfectly in your kitchen. Accurate measurements are essential to planning your new kitchen. With these measurements your designer will be able to help you create your dream kitchen.